The holidays are a time for giving. We buy gifts for everyone we can think of. Choosing the perfect gift for kids, for grandparents and even for the teachers. We hope the gifts will bring a smile to their faces over and over. Well I propose you remember one person who probably never makes your list… YOU! I find it easiest to justify a gift to myself if it is useful or has real purpose. A gift that combines need with want makes this Mom one happy girl. Cozy Socks – There is something awesome about cozy feet. I buy myself a new pair of fuzzy socks every year. So simple, so inexpensive and so, so very comfy. The Miracle Morning – This is one of the best gifts I’ve ever given myself. The Miracle Morning has made all difference for me this year. It’s offers a clear guide to making the most of the morning and starting your day with purpose. Menstrual Cup – WAIT! Don’t leave me. I know this isn’t something you expect to find on a gift list, it’s uncomfortable to talk about and is probably going to be way more than you want to know about me… BUT it’s important so keep reading! I’m so glad someone told me, so I am just going to get though the awkward and tell you. A menstrual cup (in case you’ve never heard of such a thing) replaces tampons and even pads. It’s a one time purchase of $40 (can you imagine the money you’ll save in the long run???) and is pretty much life changing. I won’t go into too much detail, you can read the comments about the Lunette on Amazon for that. It’s the one I use and I’m hooked. If I could I’d buy 20 and hand them out to every woman I know. So there you go… that wasn’t so bad was it? Coffee Mug – Or water cup or wine glass. You get the idea. Last year for my birthday I received a simple and pretty monogrammed coffee mug. I love it. I smile every time I use it. Find something pretty like that. A New Tool – You know that idea that tells men they should never buy their woman something with a plug? That rule does NOT apply to me. I love getting something that makes my life easier. The tool can be for a hobby, for housework or for work… as long as it’s something I’ve been longing for, it’s gift worthy. This year I would love to gift myself a housekeeper for a few months . I’d also be pretty excited to get a Vita Mix Blender. My poor little blender might not last much longer! 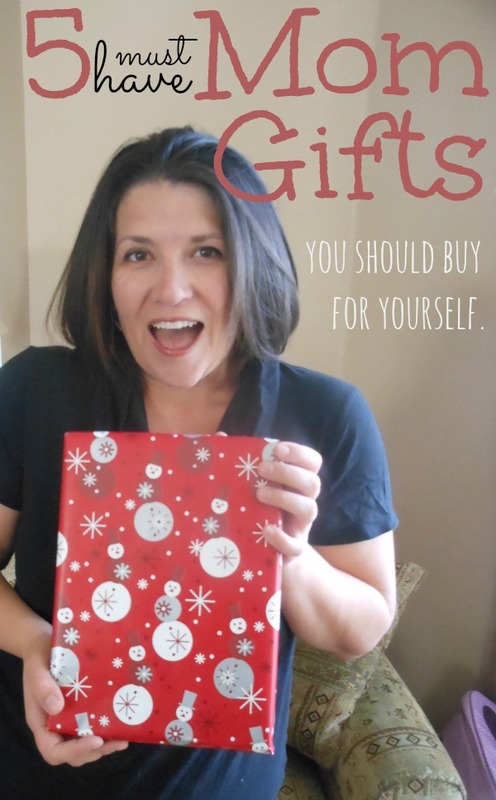 Are there any Mom gifts you would add to the list? I love James Patterson and Nicholas Sparks books. My favorite James Patterson books are : Kill Me If You Can and The Lake House. They are so weird they keep you interested! He’s very creative! Nicholas Sparks… I love all his books except Message in a Bottle. I never could get into that one! I always put a massage into my holiday budget for the years when we’re hosting. It’s something to look forward to during the busy month and makes me focus on myself (for a whole hour!) when the rest of the time I’m prepping, cleaning, cooking and shopping to make the holidays run smoothly. I agree with you on the cup! They are life changing and save SO much money!